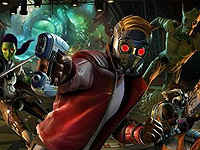 Star-Lord receives a distress-call from the Nova Corps requesting the assistance of the Guardians on a nearby Kree planet, where their forces are being decimated by the mad Titan, Thanos. Thanos' ship takes down the Milano, causing it to crash-land at the planet. The Guardians survive and Rocket reveals he's constructed a new gun that can emit a highly powerful force, but can only shoot one shot. When a large building Thanos escaped to is held shut by two metal doors, Peter goes to the inside to open it from there, finding the corpses of multiple Nova Corps members along the way. The Guardians then confront Thanos, who has obtained an ancient artifact called the Eternity Forge.